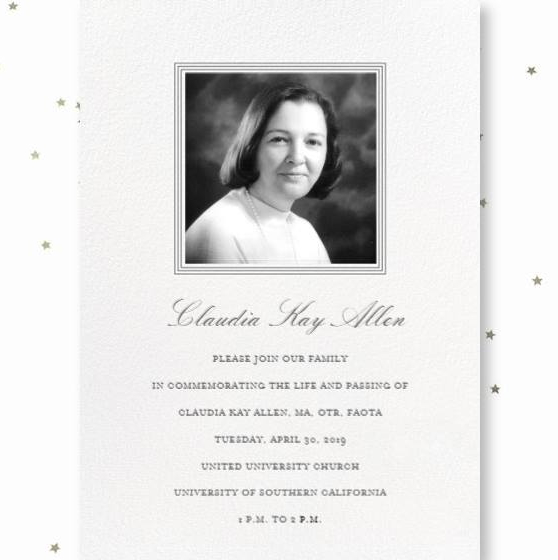 It is with great sadness that we tell of the passing of Claudia Allen on February 25, 2019. She struggled for many years with cancer, but her family describes a pain free and peaceful passing. Claudia will be forever known in the OT community as a pioneer and leader, advocating for the rights of those we see with cognitive disabilities. Her work, the Cognitive Disabilities Model, serves as a guide in creating an environment with “just the right challenge” to enable independence in participation in daily occupations. We will continue to work to promote the use of the Cognitive Disabilities Model, following our vision and mission statements. For those who wish to pay their respects to the Allen family, the invitation to the memorial service is presented above. Welcome to the Allen Cognitive Network, the offical website for Allen Cognitive Advisors, Ltd.
foremost we are about the people we serve. Our mission is to promote and advocate for the value and understanding of Allen's Cognitive Disability Model through education and networking opportunities that empower health care professionals to promote best abilities to function for individuals with cognitive disabilities. This website serves as the home of Allen Cognitive Advisors, Ltd. This is a non-profit membership organization. We are an international group of healthcare professionals. Members of the organization pursue clinical, teaching and research activities related to psychosocial, physical and geriatric rehabilitation and habilitation. This organization operates entirely by volunteer efforts. You are welcome to participate, sharing your skills and interests with this international group of dedicated professionals. The cognitive disabilities model had its beginnings at the Eastern Pennsylvania Psychiatric Institute in the late 1960’s when Claudia K. Allen, MA, OTR, FAOTA and her colleagues first observed patterns of performance difficulties in adult patients with mental disorders. In seeking to better understand and thereby serve the needs of these individuals, Allen and other therapists began a systematic and careful collection of observations of these difficulties. The focus of inquiry at that time was the “sensorimotor actions originating in the physical or chemical structures of the brain and producing observable and assessable limitations in routine task behavior” (Allen, 1985). The construct of “functional cognition” has since become a useful term for describing the focus of concern of the cognitive disabilities model. Functional cognition encompasses the complex and dynamic interactions between an individual’s cognitive abilities and the activity context that produces observable performance.